Notice the missing, the sad, the alone, the hurting, the grumpy. Showing an interest and concern is the doorway into helping these people. There are lists available from uptown of children who have not been for a while, if you are connected to the children, look them up. and understand the dynamics of why we sing so that you can help people on the journey. Leaders should be ready to connect with God at these times, model the passion and love for God that a believer should carry. If people ask why we sing with modern instruments and tunes, it’s to be relevant to unsaved people, so they can hear the Gospel in a language/way they are familiar with. B) North, Howick, Mooiriver, are acoustic like Matt Redman, Tim Hughs, Chris Tomlin etc. E) South and East , is like Hillsong, Jesus culture etc. When the church gathers around the tables, elders should be on the look out for those who are alone. Offer to pray with them and break bread with them. Once you are finished, why not take some bread and a cup to people who have stayed in their seats. Don’t be pushy, simply show you care. I understand that sometimes we all need to receive, but as a general rule, leaders should come ready to give. If you spot a car park without welcomers, a door without a greeter, an involvement desk without a helper, a car park without a mascot, a band without a singer etc. Volunteer. Church leaders are the hosts, treat our facilities as you would your living rooms. If you see paper lying around or a pick pocket on the prowl, do something about it. Redeem service. If people see that what they are doing is part of the great mission of Jesus, they will feel that their contribution is part of Gods redemptive plan and therefor worth while. People in small groups aught to be challenged midweek to engage in service on Sundays. 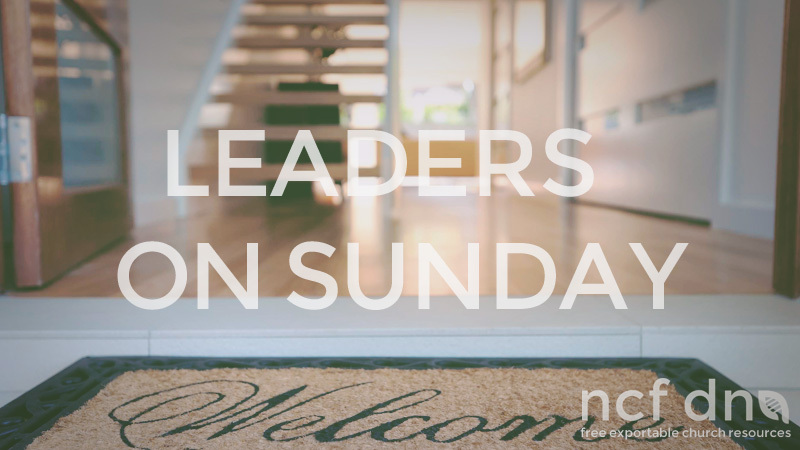 We hope that this resource blesses you and the way you lead in your Sunday meetings. Feel free to print, edit and distribute this document.